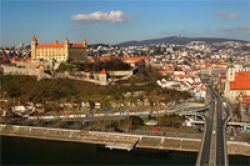 Description: The project is intended to prepare the project implementation documentation of the Eurovelo 13 cycling route of the section of Devínska nová Ves to Moravsky svätý Ján, and the Feasibility study for the vineyard cycling route between Bratislava and Trnava. On 13 January a workshop will be held at the BSR premises dealing with the setting out the vineyard cycling route at the foot of the Little Carpathians. Description: Improvement of the quality of the cycling tourist and cycling transport infrastructure in the Slovak territory of the Centrope region. The project is intended to prepare the necessary project documentation for the subsequent building of the cycling route connecting the Cities of Bratislava and Trnava beneath the Little Carpathians mountains including a connection to the Austrian network of cycling routes. Description: Support of agritourism in rural areas of the Bratislava and Trnava regions. The Project has been focusing in particular on the areas of local gastronomy, winemaking, folk art production, and leisure time activities in regions. An important part of the project is the networking of high-quality regional partners and producers, and the provision of their efficient cooperation ad marketing towards general public. Description: The project is intended to create a multilateral, binding, and sustainable framework for cooperation of local and regional authorities, bodies, enterprises, and public institutions in the Central European region. The specific goals consist in creating a polycentric framework of cooperation that should enable all partners to work on cross-border issues jointly and more efficiently. Moreover, the project offers new tools of a more balanced territorial development as well as integrated development strategies and action plans.